Soaring through the air on Zip lines! It's one of the Smoky Mountain's most popular attractions! A gliding experience the whole family will love! If you've never experienced this exciting ride, then do it! And the best place, is right here in the Great Smoky Mountains! Wahoo Zip Lines is the place where your heart starts pounding, and your adrenaline starts pumping, and you bellow a big hillbilly hollar...."WAHOO!" 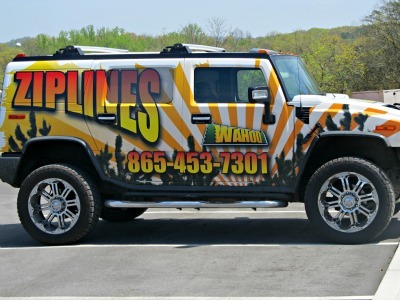 This Sevierville attraction gives you six thrilling lines to choose from! Each unique ride sends you "zipping" over the tree tops at 40 mph! This is one trip you can't afford to miss! Guides are available for private family tours. If you're interested in team building exercises for your school, church, or company, sign up and get ready...for the big WAHOO! GET A "BIRD'S EYE VIEW" SOARING OVER THE TREE TOPS WHILE ENJOYING SMOKY MOUNTAIN ZIP LINES! Take your adventure to new heights at Gatlinburg Zip Lines! It's the place to go for an "adventure of a lifetime!" There are nine lines - each carrying a unique ride of its own! Guides are with you, so anyone can ride! After you experience the "ultimate" thrill" of zip lining its time to move on to some other great adventures! Take the challenge on a self guided 22 ropes course. This course comes complete with a swing, and a snowboard! You can even glide on a trapeze, climb ladders, and walk over bridges! Since this park is a block from downtown Gatlinburg, you're close to everything this fair city has to offer, yet surrounded by the beautiful Smoky Mountains.